A new story due to the failure of my laptop's hard drive and hence the unfortunate loss of the Luverdense save. Torns IF are a Swedish Second Division side and were founded in 1965 and are based in Lund, Torns IF have never won anything in their existence. Torns IF play at Tornvallen which has a capacity of 4,000. Very nice little challenge there - if they haven't won anything before, this should be good. Bets of luck! Update after first match in charge of Torns IF. We faced Swedish First division side Limhamn Bunkeflo 2007 at home in front of a crowd of 54 people and unfortunately could not hold on to a 2-0 lead in the last 10 minutes meaning the match finished 2-2. There will be a match report next game. I will not say who we are facing or where at this time. 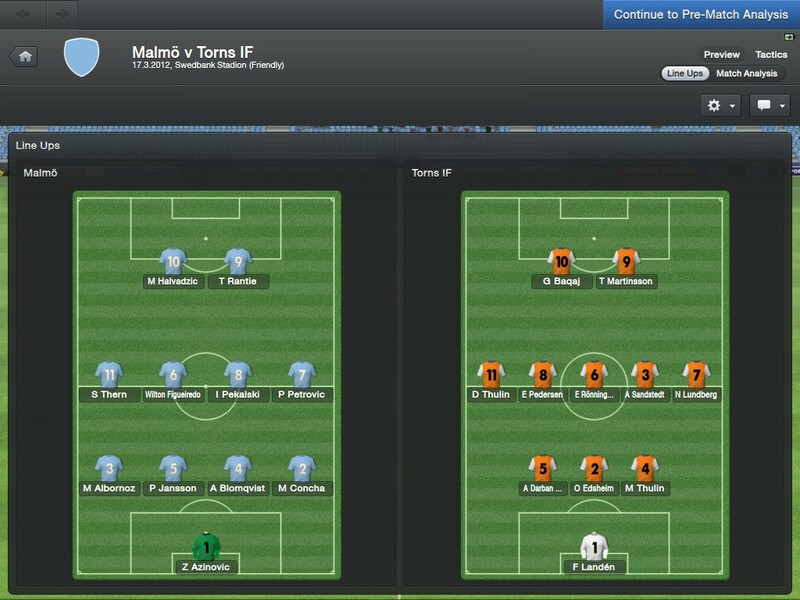 15' - GOAL for Malmo FF! Petrovic swings a first time pass left to Wilton Figueiredo, Wilton Figueiredo passes to Miiko Albornoz, Albonoz crossed into the box and Petrovic scores! 17' GOAL for Torns IF! - Miiko Albornoz intercepts the ball for Malmo FF, Guri Baqaj outpaces Albornoz to win the ball, space opens up for Baqaj, he smashes the ball towards the top corner, GOOOOOOAAAAALLLLL!!! Unbelievable, Torns IF have drawn level! 21' Ivo Pakalski lays it wide to Matías Concha on the right, Concha crosses into the far post, Halvadzic heads it but it skims the top of the bar and goes out of play. 35' After another long series of passes, Torns IF get the ball to Emil Pederson who has a shot from 25 yards out, Azinovic beats the ball away, Baqaj pounces on the rebound and scores but its disallowed. 45+2' The referee blows for Half Time after Wilton Figueiredo's shot goes over the bar. 65' - GOAL for Malmo FF! Wilton Figueiredo passes left to the feet of Alex Nilsson, Nilsson passes it out right to Thern, Thern crosses into the box, Friberg heads across the goal and its in! 2-1 to Malmo FF here at Swedbank Stadion. 67' Torns IF get the 2nd half back underway, can they draw level again? 82' After a Torns IF goal kick, Friberg gets the ball for Malmo FF and plays the ball to Rexhepi who shoots but hits the post. A brief summary of the events tragically lost due to a very unfortunate server failure. Many thanks to stam for getting FMScout back up and running as soon as possible, we all appreciate it. 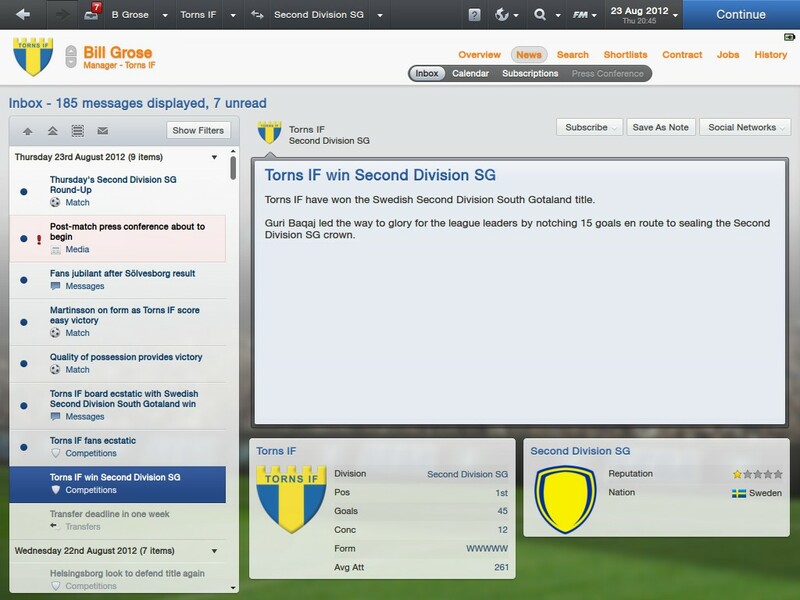 2012 was my first season with Torns IF and we won the Second Division Sodra Gotaland that year with 4 games to go of the season, this was the club's first ever trophy in its 47 year existence. The club's reputation also increased from Local to Regional after this. 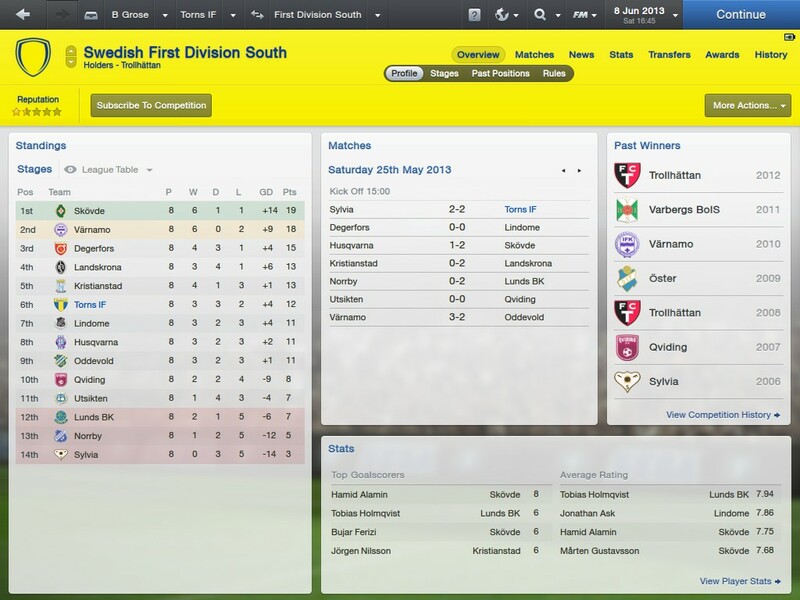 Unfortunately we were not in the Svenska Cupen that year which was won by Malmo FF. We were the league's overachieving team and several of our players won awards, I also won 2 manager of the month awards that season. 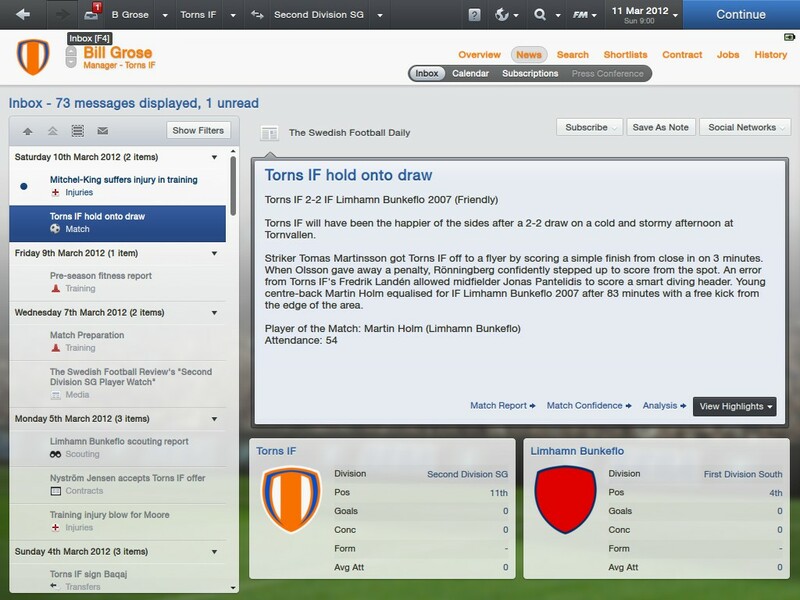 The 2013 Pre-Season was very eventful mainly due to my car accident while on my way to play a round of golf at the local golf course, this resulted in my assistant manager taking over for the last 3 matches of pre-season. 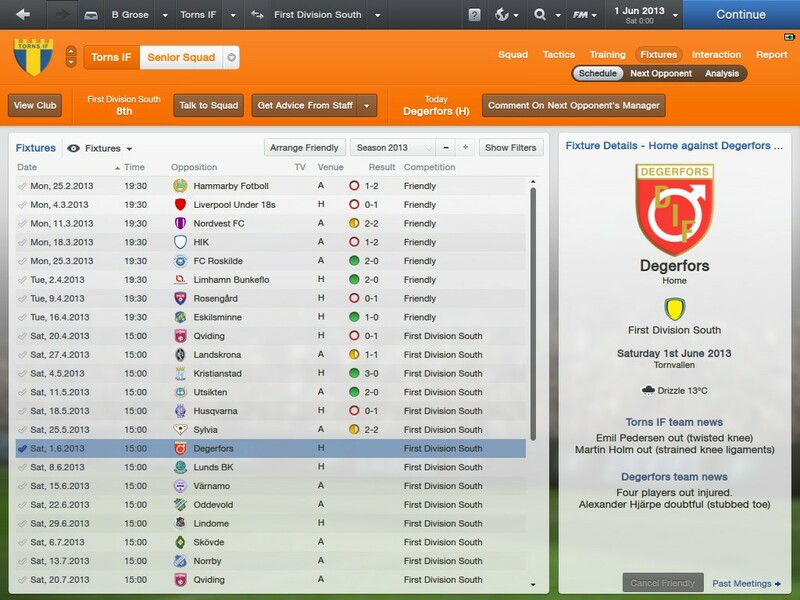 The results in Pre-Season were mixed with a roughly equal amount of wins and losses as we prepared for the club's first ever season in the 3rd tier. 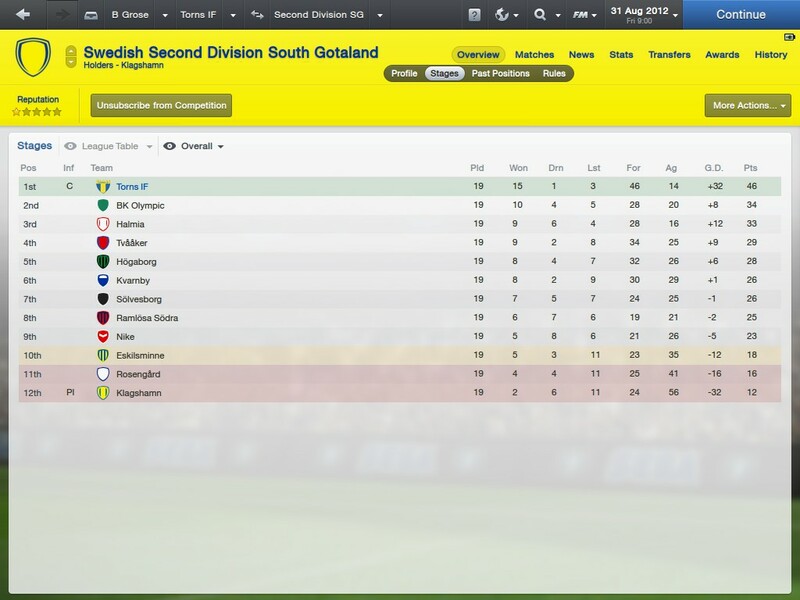 We are nearly halfway through the 2013 season now and we are 6th in the First Division Sodra which is slightly better than I was hoping for. We are currently on a 3 game unbeaten run ahead of our game ahead of a visit to 2nd placed Varnamo but unfortunately have several injuries right now which is making things a bit tougher. Our Under 19's side have just reached the 4th Round of the Under 19's cup and I wish them the best of luck. Nice Results! Keep it up tango! Keep it going Tango.....you do have some great results there!!! Brilliant Tango, great to see you back. You are reading "Torns IF - A new force in Swedish Football".